When we began rehearsals for Wait Until Dark, I was completely terrified. Now as we head into tech, I’m still scared to have an audience share the Shoebox with us, but I also can’t wait to share Susan’s story. In addition to the typical challenges of rehearsals,the play presents me with the massive challenge of portraying a newly blind woman. In the months that led up to rehearsal, I’ve been researching, reading, watching videos and meeting people that live in this world. With each book or person, I’m fascinated by the struggles and joy of a blind woman. One book in particular, Laurie Rubin’s “Do You Dream in Color? Insights From a Girl Without Sight”, speaks to who Susan Hendrix is at the heart of all the chaos and fear she encounters over the course of the play. Laurie let nothing stand in her way, be that learning how to ski to join her family on winter holidays, attending Oberlin to study voice, and facing rejection in the performing arts. Out: Growing up blind, how did you tap into your determination and find the power from within to keep going and continue to your goals? Although Laurie has been blind from birth and the character of Susan Hendrix has only been blind for a year and half, I think the joy and fire that make up both of these woman are the really weapons they have to tackle obstacle and insecurities presented daily. Susan has her husband Sam, a fellow survivor and true partner to keep her strong and safe at the beginning of the play, but what I personally admire about the character of Susan, is that she must learn how to survive and stand on her own, without him by her side. As we head into tech, and eventually add audience members, I stand backstage reminding myself of all that Susan has lost but also gained in the loss of her sight. She has been given the gift of truly discovering her inner strength and purpose, and the power of trusting yourself. I do hope you’ll join us at the theater this fall! 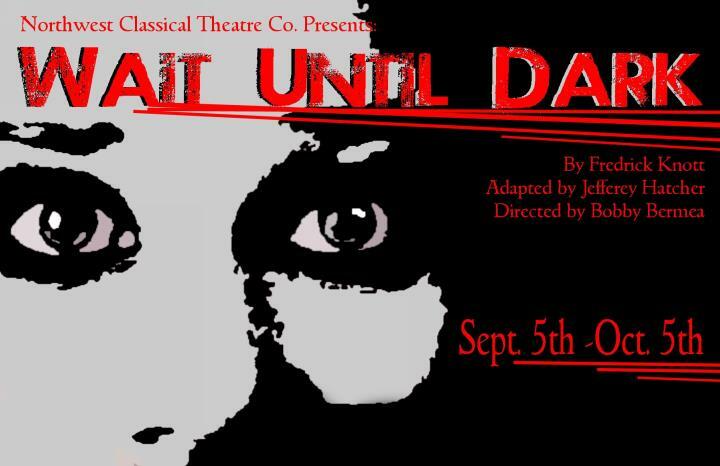 Wait Until Dark presented by Northwest Classical Theater Company opens at the Shoebox Theater September 5 and runs through October 5th Thursdays-Sundays. Tickets are at www.nwctc.org.